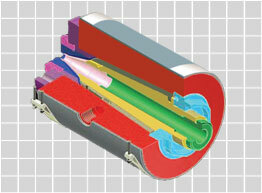 dual-layer crosshead, the S.O.S. head is capable of running single-layer, dual-layer and skin layer applications... with multiple stripes on top of it all! And if your process requires an adjustable head, the S.O.S. can easily be converted to an adjustable crosshead with minimal parts. Switcher is a trademark of JoeTools, Inc. All rights reserved.